First video game you ever owned? I am not asking the first video game you ever played, instead the first YOU ever owned and played. For me it was Tomb Raider (1996). The game system I owned myself was the original PlayStation. the first game I remember owning was Spyro the dragon. Followed by Choplifter (1982) for the Apple ][+. Pong, but way after it was cool and way before it was cool again. I think it was super mario on the 64. Kings Quest was so much fun! So were the winter olympics. I had such an old school computer--Atari ST I think it was called. the original super mario bros that my parents bought me when i was a child. However, the first video game I actually bought for myself was Final Fantasy VII. Tomb Raider in 2001! I got it free with my very first mobile phone--the Ericson T20. OMG I am old - the first game I ever owned was Pong. It was a self contained console with two controllers and four varieties of the pong game. Being old however is not a bad thing! You were able to witness the birth of many gaming technologies and platforms, I envy you really. I'm with ya - mine was Pong. I could sit there and play for hours - what a novelty it was back then! Mine was Pong too! 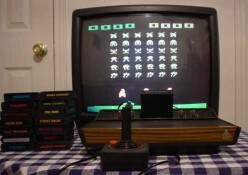 Loved my Atari! My dad and I would sit and play for hours! I had the same console. Super Mario Bros/Duck Hunt when I bought the original Nintendo. Definitely an amazing time. I miss that orange gun with the loudest spring trigger I've ever heard. We only had a PC when I was growing up (starting at about age 10), so my first video game was Dig Dug. Followed by Commander Keen and Crystal Caves (gotta love Shareware)! 4D Boxing for the PC, followed closely by Legend of Kyrandia, also for the PC. I believe my first game was either Diddy Kong Racing or Zelda Orcarina of Time can't remember thatt far back to be sure which was first. We were lucky, a friend of our parents owned all the rental 'video games' on the island (here in Guernsey). These were the type you used to put 10p in to play them and they were common place in bars, arcades and hotels. This friend first loaned/gave us a proper 'tabletop' version of 'Asteroids', hence I became brilliant at it because we had it for months and never needed to put any money into it, and then later he swapped it for us so we could have PacMan instead (I also got very good at this). Ultimately the PacMan tabletop 'died', and the friend gave us permission to donate it to a local charity in case they could fix and sell it. No idea if they did or not! Essentially we 'owned' both games at the point we had them as he would never have asked for them back. There are restarting the whole Tomb Raider franchise now. Pitfall on the atari 2600 was my first game ever. Great game back in the day -- need to catch up with all the new pokemons. Heartgold and black etc.. The first game I ever owned was for the black and white Nintendo GameBoy (I got it after the color versions came out thus making it affordable) and that was Zelda. I wouldn't own another system until two years ago when I agreed to get the Wii (ironically another Nintendo system). The first game i ever owned is The Sudden attack. Its a shooting game. i love to play it.After this game in 2011 i didn't purchase any other game.But i think i purchase a new game for my palystation 3 soon. I'm pretty sure it was megamania for the old Atari system. That or Pitfall. 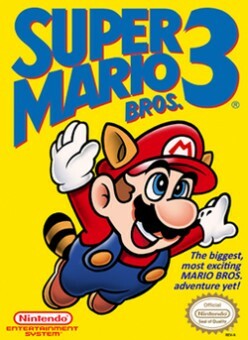 My first game was Super Mario World 2 & 3 for the first Nintendo. Atari 2600. My first game was actually 100 or so games in a single cartridge - all of them kind of rubbish. Alex Kidd - the built in game on the Sega Master System 2. Pong that you hooked up to the TV set. That's what I'm talking about! I had exactly the same thing as my first video game!!! Atari! Warlords. I would love to play an Atari now. Command and Conquer Red Alert! It was an amazing video game. Space Harrier on the Sega Master System. I honestly can't remember which SNES game was our first/we got with system when we bought it. Maybe Ken Griffy Jr. Homerun Derby? I do know we've had Tetris Attacks (the Mario one) for what seemed eons. Still looks like one of the great things of all-time man has ever created. I wish someone would bring a version of it out again - I loved that game. Edit: it wasn't an Atari - it was a Commodore 64. It used to take half an hour just to load the game! lol i think mine was the war chess game that had to be loaded on DOS. I needed a couple of floppys for that one. Crash Bandicoot. Great game haha. Atari Space Invaders for me too. But once I got Super Breakout it was all over. 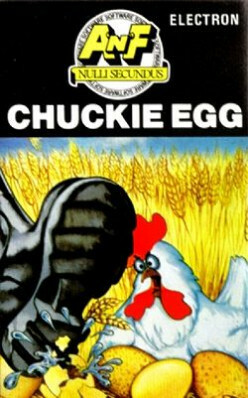 Mine was chuckie egg on the zx spectrum, Legend of a game, showing my age though I guess, after that it was the great game Bruce Lee!. Wow what a blast from the past! I forgot all about this game! I was 4 years old. We had just gotten the NES. My first game was Super Mario Bros/Duck Hunt. Good times. 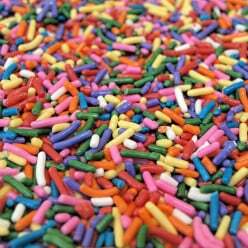 This is a GREAT thread for nostalgia!! What was the first video game you remember playing?Mine was River City Ransom for the NES. what is best video game you ever played ? what is best video game you ever played ?My all time favorites are half-life, super metroid and KOTOR. What's the very first video game you ever played? What is your favorite Mario Game for the Nintendo Wii ?